When a baby bunny needed a mommy and didn't have one of her own around, the pretty momma kitty stepped up to the plate and adopted the little thing (who isn't really so little and is actually bigger than her kittens)! Now they all belly up to the milk bar and drink away to their hearts content. I have a feeling they'll all grown big and strong and be the best of friends! BONUS CUTES: Capybara adopts puppies, cat adopts baby hedgehogs and dachshund adopts baby pink pig! Alex the dog likes to boogie down! He starts off with a simple moves, just a two-paw motion... but then he really kicks it into high gear and gets down with his fancy breakdancing skills! He puts three paws together and rotates around in circles with the fourth one. Get this doggie a boombox and a big beat! He's a great breakdancer! Thanks to Cutehead Lauren G. for sending us this cute breakdancing dog video. She always find the silliest videos! It's My Birthday and Cute's 2,000th Post! Let's Celebrate Big Time! Today is a big day all around, and we're celebrating the only way we know how... With lots of cute stuff and kitties and more cute stuff -- and some giveaways! Not only is it my birthday, but can you believe this is our 2,000th post? That's a whole lot of cute! I am so happy to share all of this with you all and to have met so many wonderful people so we can do so many awesome things! Next order of business: Let's kick off this party with some baby pictures of me! Because I was a cute baby and my mom has been sending me these for two days straight now. I love them! This is a picture of me on my first birthday! I was a sun bunny at an early age..
Baby me in an adorable little dress. My mom and I at the pool! Ready to celebrate? Yeah! Let's celebrate by giving way some fun birthday-ish themed kitty stuff! 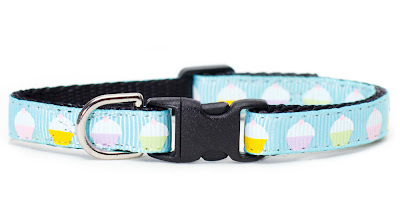 Our fab friends at Sweet Pickles Designs are offering up this cute "The Icing" collar, which is a sweet cupcake design, perfect for any occasion really... but extra perfect for today! We love their collars, and Pimp and Moo wear them almost exclusively. 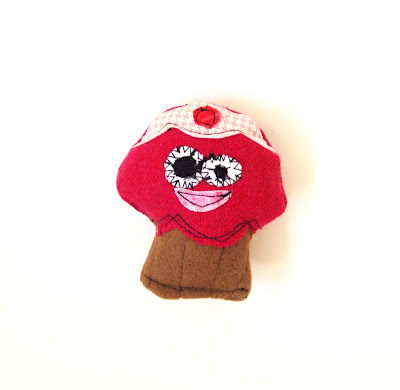 Then, our friends at fuglyfriend have offered up this silly cupcake-ish wool cat toy that one lucky Cutehead will win! All of their toys are so silly and so cute, in a really different kind of way! You should go see what else she has! To enter to win, do any or all of the things in the Rafflecopter box below (there's even a freebie entry there where you don't have to really do anything to enter)! Two winners, one for each prize! Winner can be anywhere internationally. All entries must be received by May 7, 2013 at midnight EST! If you haven't seen this one going around yet, you're in for a treat. There's really not much to add here that's not in the title. Here's a cat in a shark suit riding a Roomba and chasing a duck. You can't make this stuff up!